This face, framed by a radial headdress, exudes an expressive strength reinforced by the ragged, jigsaw treatment of the eyebrows, moustache and beard in a typically early 17th century fashion. The third eye allows the figure of Bhairava to be identified as the fierce manifestation of Shiva, an effigy of whom appears on top of the head. Equally recognizable by the third eye. The headdress features a rhythmical decoration of finials highlighted by medallions of blue stones. The holes pierced in the ears were probably intended for jewelry made from some other material. With its copious, delicate and refined ornamentation, the piece is typical of Newar art from the Kathmandu valley. The making of the copper mask involved a variety of techniques ranging from sculpting and planishing, to repoussé work, inlays and polychromy. During the festivals of the Pachali Bhairabjatra and the Indrajatra, which took place in late September in the city of Kathmandu, masks of the Hindu god Bhairava were displayed in front of temples and private dwellings. Beer and rice wine -regarded as prasad, or divine gifts- spouted from these effigies (which were never actually worn by dancers) and were drunk by the faithful. Terracotta and wooden masks -in some cases quite large- were also used. The Newar inherited Indian culture, artistic influences and religion. 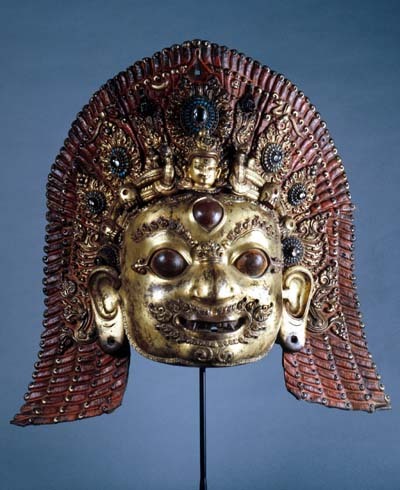 The masks were an extension of their statuary which was widespread throughout the entire Himalaya region.